I know, I know, who wants to wade through arcane rules in the Congress and get into the weeds of the government shutdown? On Oct. 1 the Republicans jammed through House Resolution 368 that changed the chamber’s standing rules to prevent any member from calling for a vote on the Senate amendment on funding the government. Now, only the majority leader, Eric Cantor, R-Va., or his designee can move such a resolution. The rules were rigged to change Rule XXII, Clause 4 – under which any member could have brought the Senate bill to the House floor – to ensure a government shutdown. 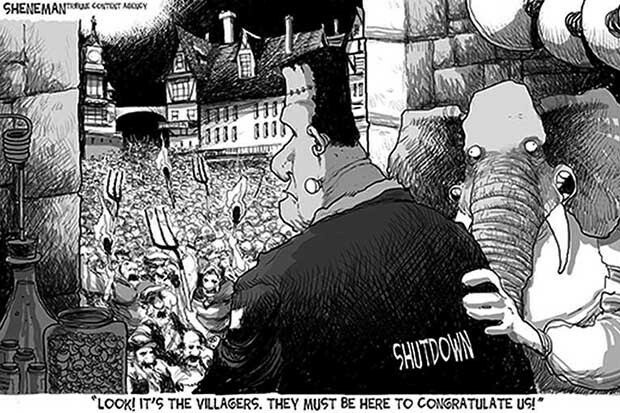 Speaker Boehner tells America that there aren’t the votes to pass a clean bill to keep the government open in the House. But he won’t bring it up for a vote. He changes the House rules at the last minute to prevent it from coming up. The Republicans stage a series of photo-ops at the World War II Memorial decrying the shutdown they caused. The House engages in gimmicks, selecting which government shutdown hostages they favor releasing, a tactic that goes nowhere. The polls for the Republicans plummet because the American people realize the game that is being played on them. Now, the reasonable, responsible voices in the Senate are crafting a way out of the economic abyss and where is the House? Sadly, they seem ready to create economic chaos by acceding to the will of the tea party wing, bringing down our country. They seem ready to use any means available, any approach that terrorizes the other side, any means to an end that they cannot articulate. The suicide caucus strikes again. The real question is: where are the rational, reasonable, responsible Republican members of the House of Representatives?